So I've become a sewing fool lately. I am finally willing to say that I think I'm a seamstress now, well maybe a novice seamstress! I've been making quilts, baby bonnets, and even a fleece jacket for a baby! But the thing that I was really excited to make was a doll for my friend's 5 year old girl. 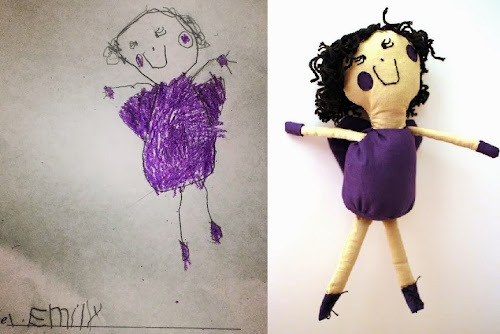 A couple weeks ago I stumbled upon some websites that allow you to send in your child's drawings and they turn them into dolls or stuffed animals. There are several websites but my favorite is Child's Own Studio. I was inspired! I thought maybe I could make a doll from a child's drawing too. Visit the website if you have a moment and you'll see what I'm talking about. 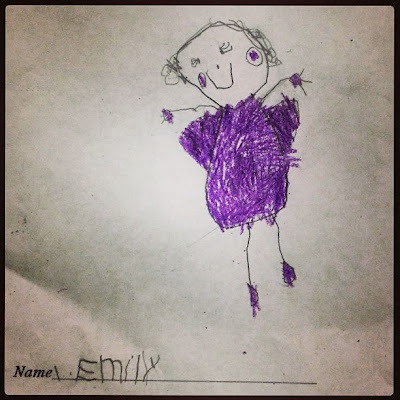 One of my friends had posted a drawing of an angel that her 5 year old daughter, Emily, had made so I thought I could start with that drawing. 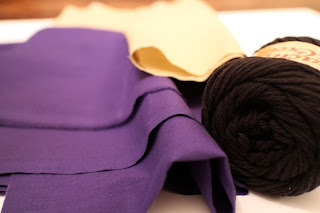 I went to the fabric store and got some purple fabric, some light tan fabric for the skin, some stuffing, and black yarn for the hair. 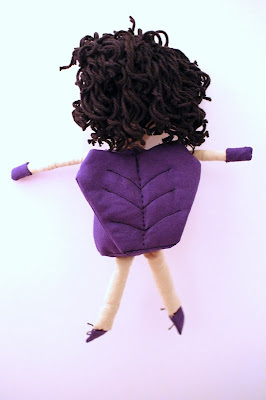 One of the challenges I ran into was how to make the yarn curly for the hair. 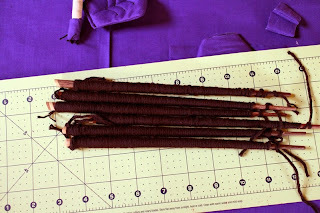 After doing some Googling I found that you could curl yarn by wrapping it around round dowels, dosing it with boiling hot water and then baking it on a low temperature for about an hour. I wrapped mine around some chopsticks! I had never made a doll before so I didn't know how to start so I just jumped in and started! After spending three nights on it, here is the finished product! I wanted it to be a surprise so I didn't tell my friend that I was making it. Emily got it today and was so excited to see that her drawing had come to life! I am so excited to try to make more toys from kids' drawings and give them that magical moment when they realize that they designed the toy they're holding. This is soo sweet! And true to form too Khammany! You have the knack for sewing, keep at it dear! That is adorable! You should write a children's book to go with it! I can't sew so I really appreciate anyone who can!!! Oh my gosh, this is adorable. 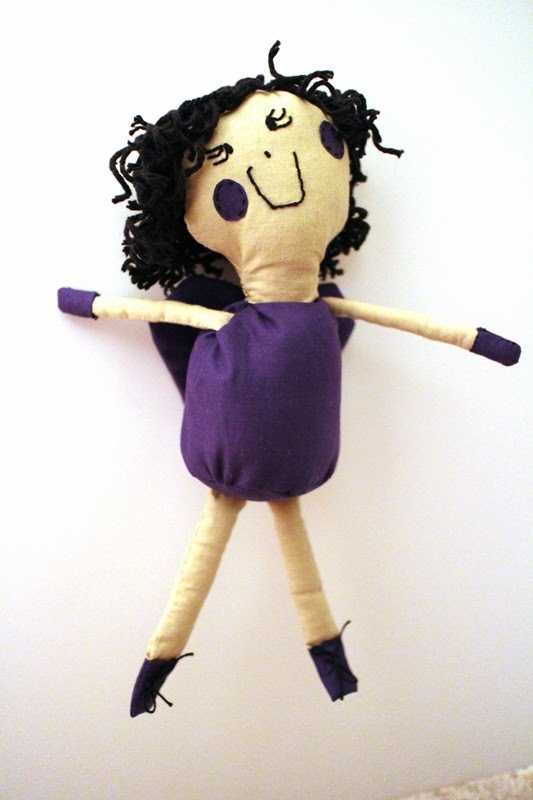 Handmade dolls are my favorite and PURPLE is my favorite color. The drawing is so precious. Oh that is precious! Kids would just love to see their art work come to life and that little angel has a wonderful new home! Fabulous, Khammany!! that is one of the coolest things I have seen! how wonderful to be able to do that!! That's really cute! I wasn't sure what to expect, but I kept scrolling. To my surprise it's really unique, rustic, and sweet. All rolled into one! Great idea, and looks so much like her picture. You are truly talented! Oh my gosh … that is amazing! It looks just like the drawing. Great job! A Sewing Star is born in you, Khammany! I have made many cloth dolls in the past, and none so clever and quirky as this. It is amazing the way you make her just like the drawing.. I am in awe of your talents. Brilliant sew! That is so sweet!! I can only imagine how excited that little girl was to see her drawing become a real doll! Khammany, That is the sweetest doll that I have seen in many years. You captured the essence of the angel drawing and recreated it in fabric. Just lovely..... A brief story, Many years ago when my granddaughters were young (they are now in their thirties) I used a pattern to make them all cabbage patch dolls. Real all hand sewn (no plastic anything) cabbage patch dolls. They were big at nearly 24 inches in length - almost as big as the girls. They still have their dolls and have passed them on to their daughters. They speak lovingly of the memories of receiving those dolls for Christmas so many years ago. My thought is that we create memories when we endeavor to make the gifts for our loved ones instead of just buying gifts. I absolutely love this! What a special gift...so thoughtful. I know this is something she will always cherish. Khammany!! That is amazing, you're so talented ~ you need an Etsy shop, my friend! !